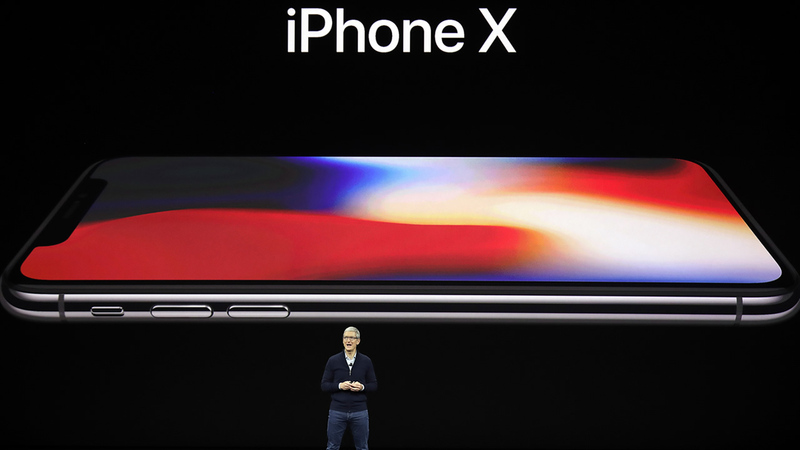 CUPERTINO, Calif. (KGO) -- At its big product unveiling in Cupertino on Tuesday, Apple released a super-premium iPhone with a super-premium price tag, refreshed its lineup of iPhones, and announced a new version of its smartwatch and Apple TV streaming device. Great sound system inside the Steve Jobs Theater. They've been playing Coldplay, the Beatles and others to keep us entertained. Apple event opens with inspiring message from Steve Jobs for whom theater is named. He spoke of creating things a special gift to others. CEO Tim Cook: Steve Jobs' greatest gift is Apple itself. A time for joy, not sadness. To inspire the next generation. Announcing Apple Watch Series 3 w/built-in cellular. Uses same # as your iPhone; receives text; stream 40 mil. Songs on your wrist. Next Watch OS 4 will have more heart monitoring features for fitness & health. Even w/cellular added,size of Series 3 same as Series 2. Tim Cook announcing Apple TV 4K for cinema-quality video at home. Will have HDR for additional video quality. Turning attention now to iPhone... Tim Cook announcing iPhone 8... 'huge' step forward, he says. New generation of iPhone - the 8 and 8 Plus. Glass front & back. Silver, space gray & new gold finish. Most durable glass ever. New A11 Bionic processor chip inside 8 & 8 Plus. 6-core CPU. Designed for 3D games. 12 MP camera. 8 Plus has dual cameras. The iPhone 8 & 8 Plus have wireless charging. Price for iPhone 8 from $699; 8 Plus from $799. One more thing: The future of the smartphone. 10 years after first iPhone... revealing iPhone X. Biggest leap forward since the original iPhone: Tim Cook. All-screen. Frame is surgical-grade stainless steel. Space gray & silver. "Super Retina display." 5.8" diameter. 2436x1125 resolution. 458 pixels per inch. OLED display. Lift or tap on screen to wake up iPhone X. No home button. Swipe up from bottom to access home screen. The iPhone X is pronounced 10. Face ID - future of how to unlock phones & protect info. The X sends out dots to map your face, even in dark, to recognize you. Neural engine still recognizes you if you change hair style, wear a hat or remove glasses with Face ID. Face ID is processed on device, not stored in cloud. 1 in 50,000 chance for mistake w/Touch ID. 1 chance in 1 million for Face ID. The iPhone X will also feature Animoji - emojis controlled by your face. Animated emojis that reflect your facial expressions. Introducing new wireless charging mat (Air Power) to let iPhone 8 or X, Watch & wireless ear buds to charge at same time. Available in '18. The iPhone X comes in 64 GB & 256 GB configurations from $999. Ship Nov. 3rd. Apple event is wrapping up nearly two hours after it started. We'll have a wrap up on ABC7 News at 5 and 6pm today. Thanks.